The roof on your home is always under attack from the weather elements. From the blustering wind of fall to the snow and ice that attack it in the winter here in Michigan it seems like there is always problems that can occur. One of the biggest problems for most home roofs is the wind and storms of spring and summer. Having a problem due to weather is common especially during storm that has high winds. It causes debris to hit the roof and the wind can sometimes damage the shingles on the roof. For home owners in Fowlerville Michigan these problems may happen at your home but Livingston Roof Pros can repair them. We offer full roof repair in Fowlerville Michigan and surrounding areas. With so many different problems that can happen on your home’s roof getting it in working order is a must. When a roof leak occurs on your home it can lead to all sorts of problems. As water enters the home from the roof leak it can damage walls and ceilings. The water entering the home can also cause damage to other items in the home that are beneath the leak such as televisions and furniture. Getting roof repair in Fowlerville to stop a roof leak quickly is a must and Livingston Roof Pros can provide that for you. We even offer emergency roof repair when you need it. Many times a home can have a roof leak and the home owner doesn’t even realize it for some time. During this time it can lead to all sorts of problems including mold growth in your home from the water leak. Getting a roof inspection on your roof can identify any problems that may be occurring with the roof. At Livingston Roof Pros we offer a roof inspection to determine just what condition your home’s roof is in and if there are any problems we offer roof repair in Fowlerville Michigan to help protect your home. It’s usually a good idea to also get a roof inspection done annually to prevent any problems from occurring and to help ensure your roof lasts a long time. At Livingston Roof Pros we offer a roof inspection to determine just what condition your home’s roof is in and if there are any problems we offer roof repair in Fowlerville Michigan to help protect your home. It’s usually a good idea to also get a roof inspection done annually to prevent any problems from occurring and to help ensure your roof lasts a long time. One of the most popular roofing materials in use in Fowlerville Michigan is the asphalt shingle. It’s been around for a long time simply because it’s one of the best roofing materials available. But sometimes there are other roofing materials that you may have on your home including metal roofing or the much less popular tile roofing. Whatever type of roofing you have on your residential home chances are we service it here at Livingston Roof Pros. Give us a call today if you have a non-standard roof that you’re unsure about and we’d be glad to speak with you about it. Chances are, we are fully qualified for your home’s roofing material. In order to properly protect your roof you’ll need a roofing contractor in Fowlerville Michigan that is fully qualified and licensed to work on the roof. 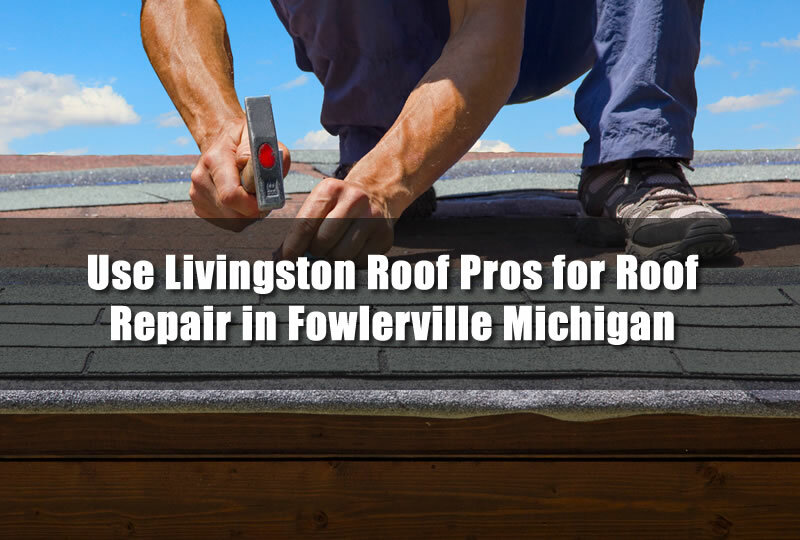 Here at Livingston Roof Pros we are fully licensed roofing contractor in the state of Michigan and we also hold certifications in many of the roofing materials that are used today. We also carry insurance and we are fully bonded just in case something goes wrong. Allowing a roofing contractor that is fully qualified to work on your roof can void the manufacturers warranty of the roof so be sure to choose Livingston Roof Pros for your roofing needs in Fowlerville Michigan. Get started now by getting a free estimate on your roof repair in Fowlerville Michigan today from Livingston Roof Pros. Give us a call at 517-940-8770 to get started.